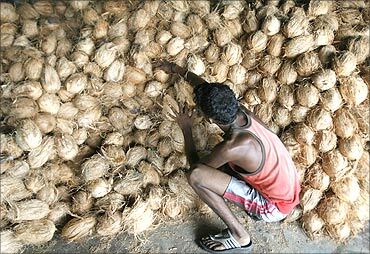 About 15,000 coconut farmers in eastern Karnataka's Tumkur district are set to double their income this year. These farmers, who were making a living by selling copra, are looking at gaining additional income from what they had until now regarded waste - coconut husk. 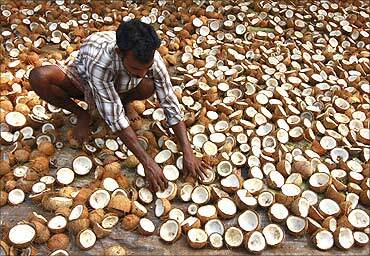 Technology developed by the Coir Board and its adoption for commercial gain by a cooperative in their neighbourhood has increased the demand for coconut husk, which the farmers convert into value-added products. A coir factory founded by the co-operative Thengina Narina Kushala Kaigarika Sahakara Sangha has transformed the lives of these farmers by producing lifestyle products from coconut husk through a cluster project jointly funded by the National Bank for Agriculture and Rural Development and the Coir Board. What was thrown out as waste and burnt as firewood is now being converted into a substitute for wood teakwood in particular. Having adopted the latest in production techniques and designs, TNKKSS has come a long way from producing simple ropes; it now makes a variety of lifestyle products from coconut husk. TNKKSS has achieved a 16-fold value addition in the process of converting coconut husk into value-added products. 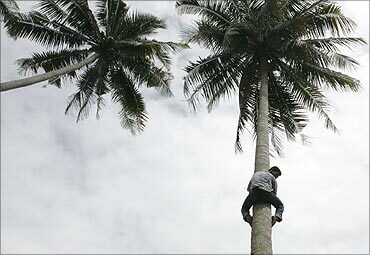 It buys coconut husk from farmers at Rs. 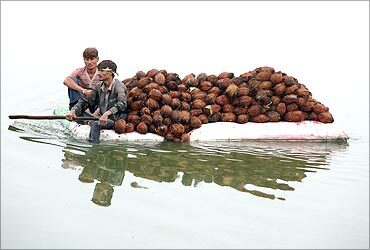 100 per 1,000 husks (or coconut shells after extraction of copra) and converts it into coir rope, which it sells to companies like Kurlon, a manufacturer of rubberised coir mattresses, for Rs. 1,600 per quintal. Over the last one year these farmers, who were earning Rs. 50 per 1,000 husks, have doubled their income to Rs. 100 per 1,000 husks. Going forward, they can expect much more, as the concept catches on with furniture-makers," said C V Reddy, assistant general manager at Nabard. The cooperative has introduced products like coir fibre, coir yarn, corridor mats, curled coir, coir composites, coir pith and needle felt or non-woven fabric. Composites can be used to make any type of furniture and wardrobes. They can be even used as wall panels for interior decoration in cinema halls, offices and homes. The 45-year-old cooperative has made a turnaround, utilising a loan of Rs. 2.05 crore (Rs. 20.5 million) from Nabard and Rs. 55 lakh from the Coir Board. The factory produces 30 tonnes of coir fibre per month and provides livelihood to nearly 400 growers, employing 40 of them directly. The factory's three satellite units are ready to commence operations soon and coir fibre production is expected to touch 800 tonnes a year, said T S Kidigannappa, TNKKSS president. The TNKKSS has received funding under Nabard's Umbrella Programme on Natural Resource Management for the Integrated Coir Cluster Development Project in Gubbi. The project covers the integrated coir factory at Thyagatur and three satellite units for making coir fabric at Nittur, Hoskere and Kadaba in Gubbi taluk. The factory has been securing orders from both the government and the corporate sector. The factory at Thyagatur, which started operations in April 2010, has won orders for its coir products from Bharat Heavy Electricals Limited; Malnad Engineering College, Hassan; Kurlon; Abhay Infotech, Ahmedabad and the Karnataka Government's education department. The Coir Board has provided technology for developing designs for products that are eco-friendly and water-proof. They are five to 10 per cent cheaper than plywood. "Home designers, furniture outlets, and industrialists are choosing coir products because they are 'value for money', a substitute for synthetic fibres, eco-friendly and versatile, light on the wallet as well as on the environment, durable and weather-resistant," said Kidigannappa. TNKKSS has mobilised equity from coconut growers, self-help groups and Stree Shakti Sanghas (women's groups) in and around Gubbi to arrange working capital. The factory is looking to earn a profit of Rs. 8 crore (Rs. 80 million) in 2011-12, said Kidigannappa. Even though Tumkur is one of the leading districts in coconut production, only 20 per cent of the coconut husk is being used for fibre extraction, the remainder being burnt as firewood said Reddy. The project is aimed at sustainably utilising natural coir husk for value addition and providing livelihood opportunities to resource-poor farmers and SHGs, while simultaneously promoting an "alternative form of wood", which is eco-friendly, he said. 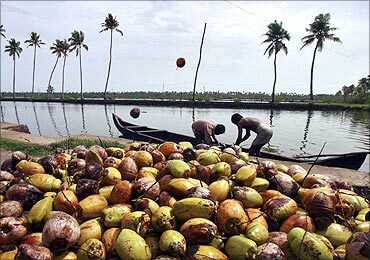 "With the success of this pilot project, Nabard is looking at replicating this model in 15 other districts of Karnataka where coconut is grown," Reddy added. 10,000 troops will leave Kashmir this year?